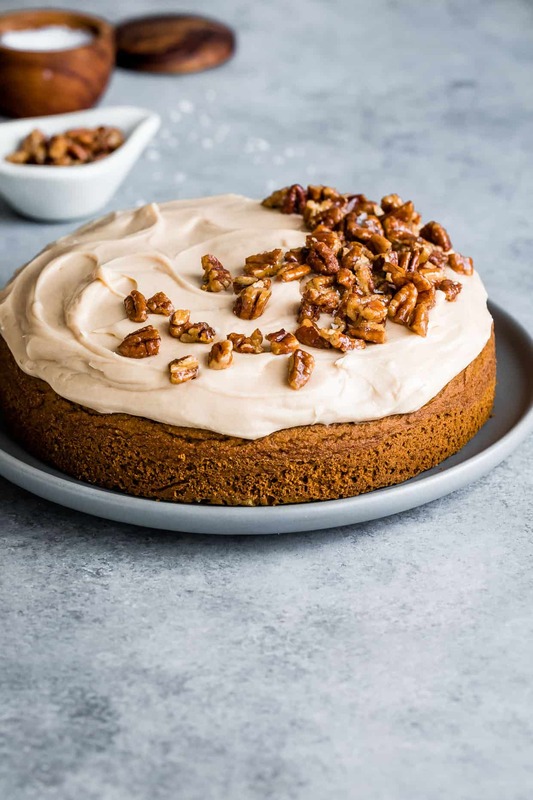 Soft and moist gluten-free pumpkin cake topped with salted caramel frosting. 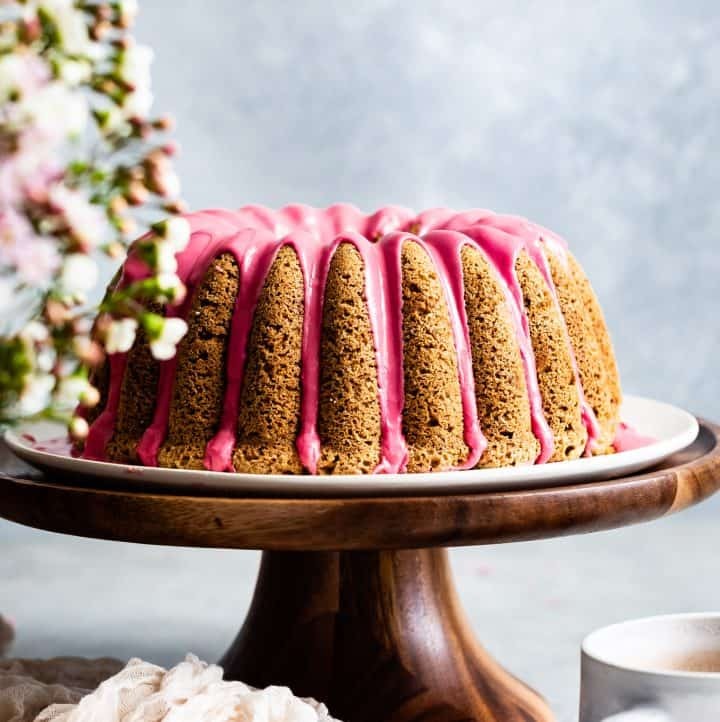 Filled with fall spices and a tender crumb, no one will believe it’s a gluten-free cake! Let the baking season commence with all things pumpkin! 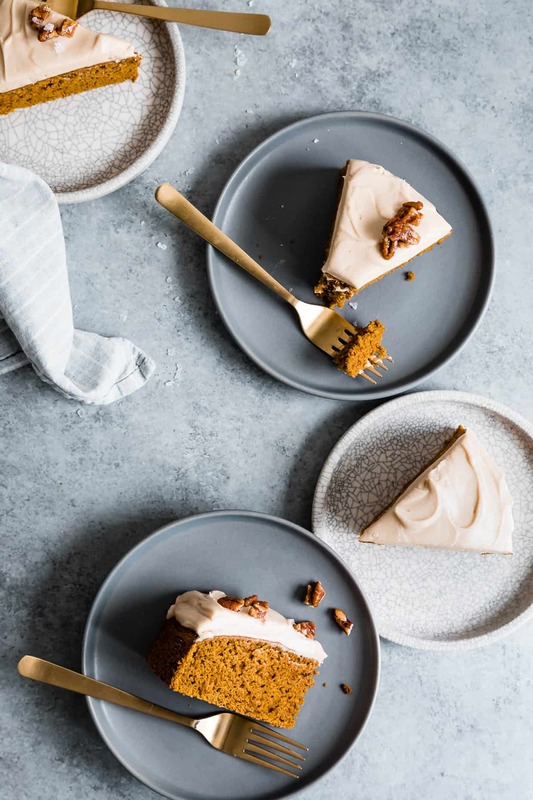 This gluten-free pumpkin cake with salted caramel frosting is here to satisfy my fall cravings. 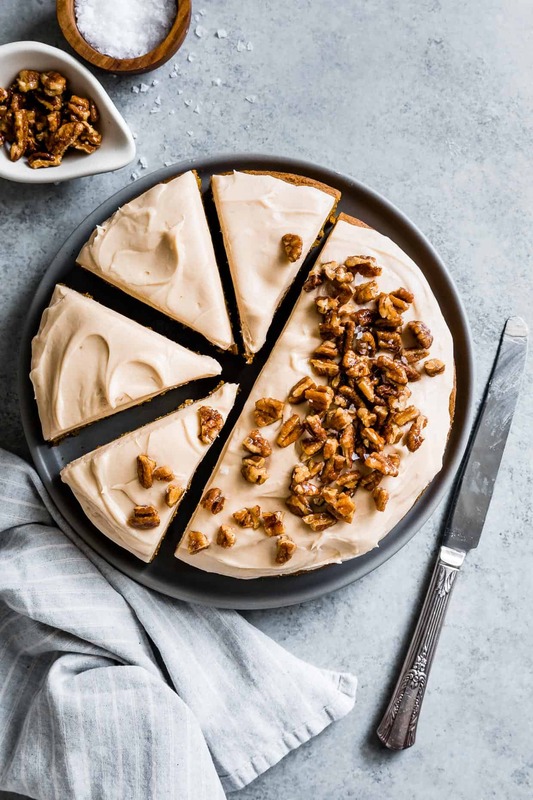 It’s got a soft tender crumb that’s moist enough to stand on its own even without frosting, but with a generous layer of salted caramel frosting and candied pecans, this gluten-free cake is the stuff of fall dreams. 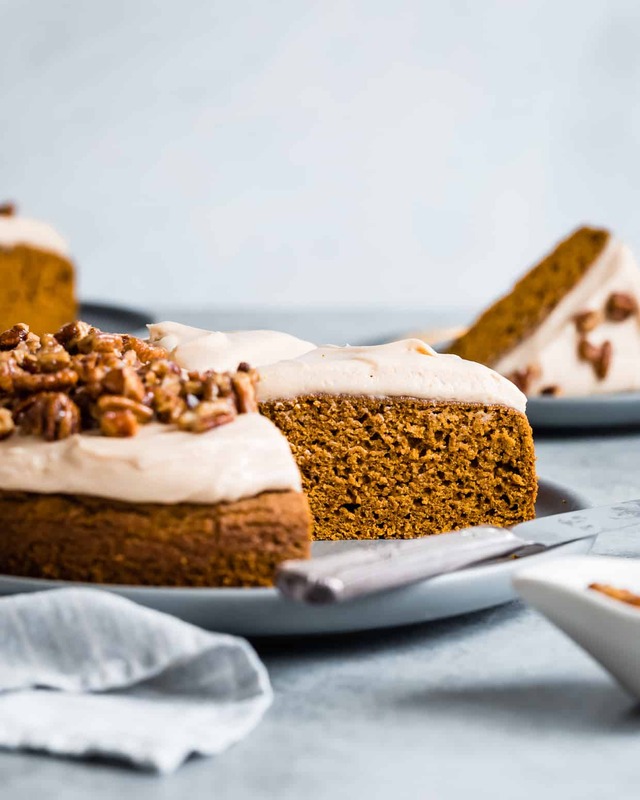 Made with millet flour, oat flour, and sweet rice flour, this gluten-free pumpkin cake with salted caramel cream cheese frosting is the sixth recipe in my year-long partnership with Bob’s Red Mill. So far this year we’ve eaten chamomile oat waffles, matcha macarons with mango buttercream, buckwheat crepes with roasted cherries & chocolate, brown sugar peach crumble, and triple berry pie with gluten-free cardamom crust. 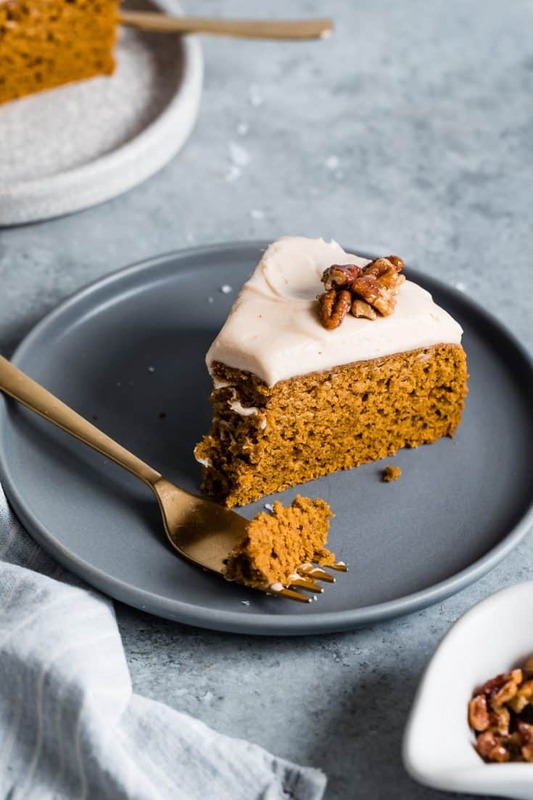 Now it’s time for pumpkin cake – my addition to today’s Virtual Pumpkin Party! Here I’ve cut this cake into 8 generously large pieces (because I’m greedy), but you could definitely get away with cutting it into 10 or 12 slices. It’s a lofty cake, so even in twelfths, each person would be perfectly happy with their serving size. Unless you’re my toddler. In which case, she very definitively wanted “THAT TRIANGLE ONE RIGHT THERE – IT’S MINE. DON’T CUT IT, MAMA” while pointing to the enormous wedge featured above. Got it, kid. But if you eat that, I’m making daddy put you to bed tonight. Note: I cut 2/3 of it off and hid it (in my belly) while she was eating dinner, and she didn’t notice. So I take that back – she really was satisfied with a 1/24th serving size sliver of cake. Though honestly, the unbridled joy on a toddler’s face when you hand them a slice of homemade cake is enough to almost make you want to give them the whole thing. Almost. Remember when she HUGGED her first birthday cake? While enjoying her cake, Zoella looked up at my mom who was on a cleanse at the time (ie. no cake for her), and said, “Nonny, you need to eat some cake.” She knows just how to rub it in (but also, she’s right, you need to eat some cake, mom). 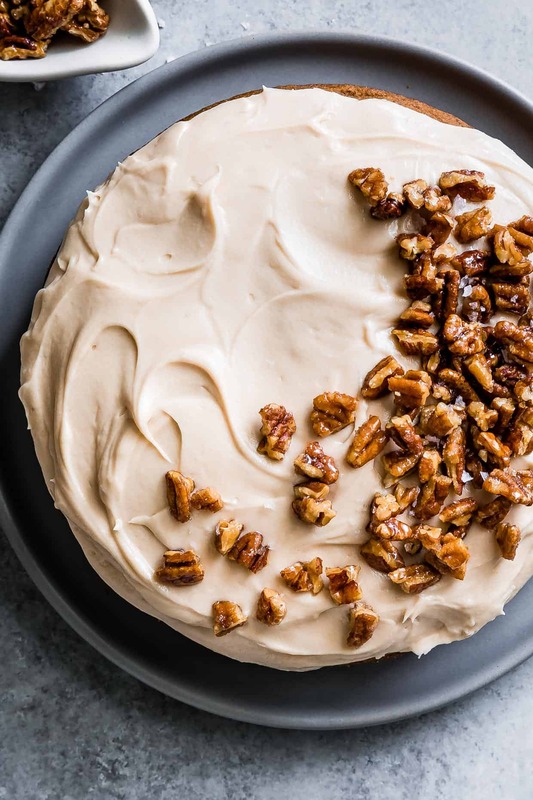 I’ve topped this cake with a generous swirl of salted caramel frosting. Both because it’s a tall cake so it deserves tall frosting and because my neighbor keeps complaining about frosting-to-cake ratios. This one, he says, has the perfect ratio. A layer of tart and sweet cream cheese frosting to pair with the fall pumpkin spices. Now that I’ve been baking gluten-free for several years, I can say with certainty that I prefer gluten-free cakes to regular cakes – when made well. 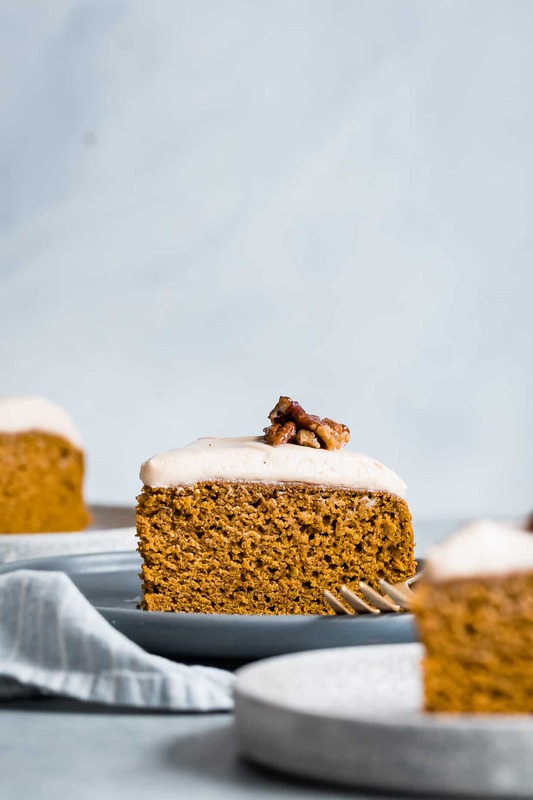 Gluten-free cakes like this gluten-free pumpkin cake, or these gluten-free chocolate cupcakes, or these gluten-free vanilla cupcakes are more forgiving in the oven and more difficult to over-bake. Add an extra minute or two to the cake and it’s still tender and moist. The key to gluten-free baking is creating flour blends, that, together mimic and enhance many of the characteristics of all purpose flour. 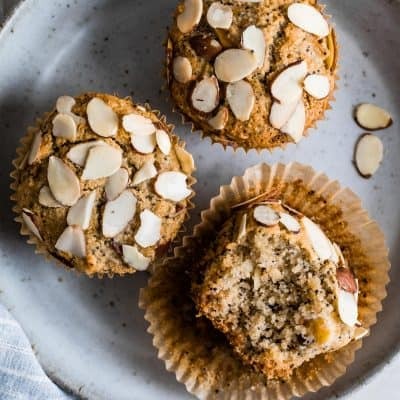 In her book Alternative Baker, my friend Alanna adapted my vanilla cupcake recipe by paring the flours down to three: oat, sweet rice, and millet flours. With her paring down as inspiration to do the same, these have now become my go-to most common flours when baking gluten-free. 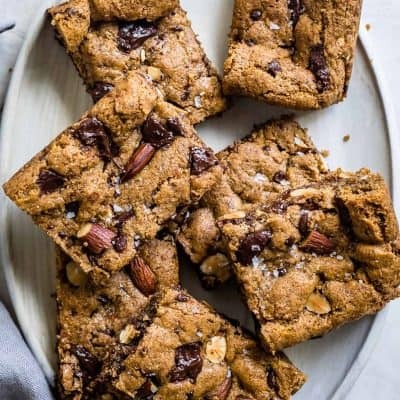 Oat, sweet rice flour, and millet flour work together to create a blend that behaves much like an all-purpose flour in baked goods like cake. Oat flour adds loft and a delicate crumb. Sweet rice flour – the same type of flour used to make sticky chewy moist mochi – gives the cake those same characteristics. It adds the starchiness that wholes the cake together with a chewy crumb. Millet flour balances it out with a neutral whole grain by ensuring the cake isn’t too cakey and moist. Can I substitute white rice flour? When folks can’t get their hands on sweet rice flour, they often ask if white rice flour can be used in its place. While I’ve never tested this specific recipe with this substitution, I have spent many years experimenting with baking with white rice flour with the result turning out to be significantly more crumbly and brittle. Think shortbread cookies that almost disintegrate in your hand when you bite down. 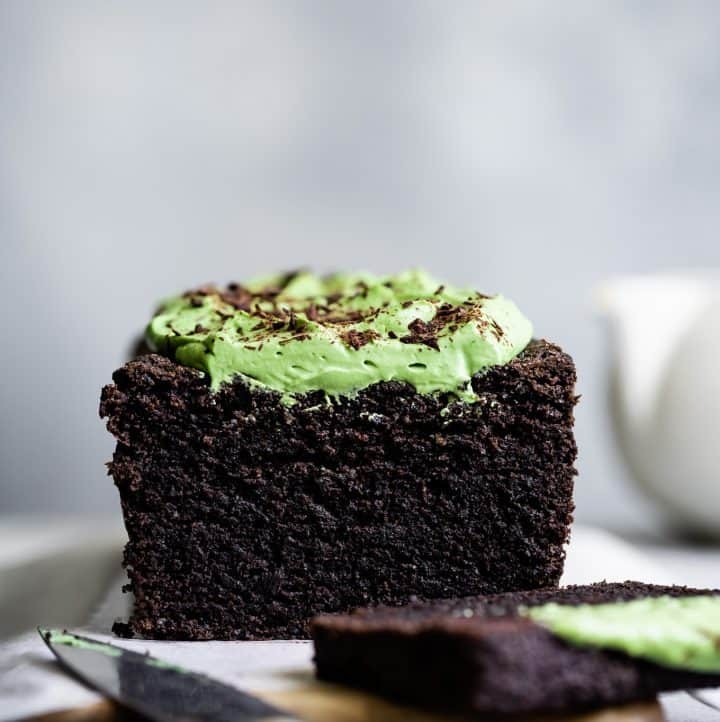 Sweet rice flour plays such a significant role in the structure of gluten-free cake, adding the stickiness that holds it all together. While similarly ground, white rice flour doesn’t have the same high starch content so your cake won’t have the same chewy texture. 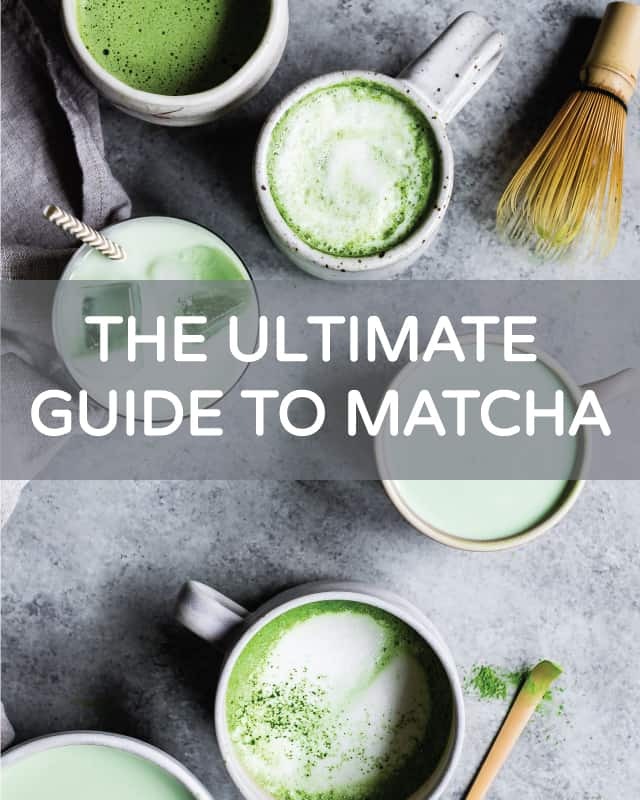 Note: If you plan on baking more gluten-free recipes, sweet rice flour is a key flour you’ll want in your arsenal and you can get it quickly on Amazon. Another question I often get is whether you can skip the xanthan gum in my cake recipes. The short answer is: yes. If you don’t have xanthan gum or cannot use it for whatever reason, don’t let that stop you from baking this cake. It will still turn out a delicious cake! The longer answer is that I recommend that little 1/2 teaspoon of xanthan gum. Side by side comparisons of my base vanilla cupcake recipe with and without xanthan gum showed a significant enough difference that I keep it in my recipes. The cake with the xanthan gum was undisputedly lighter and less dense. Without xanthan gum, the cake was gummier and denser. 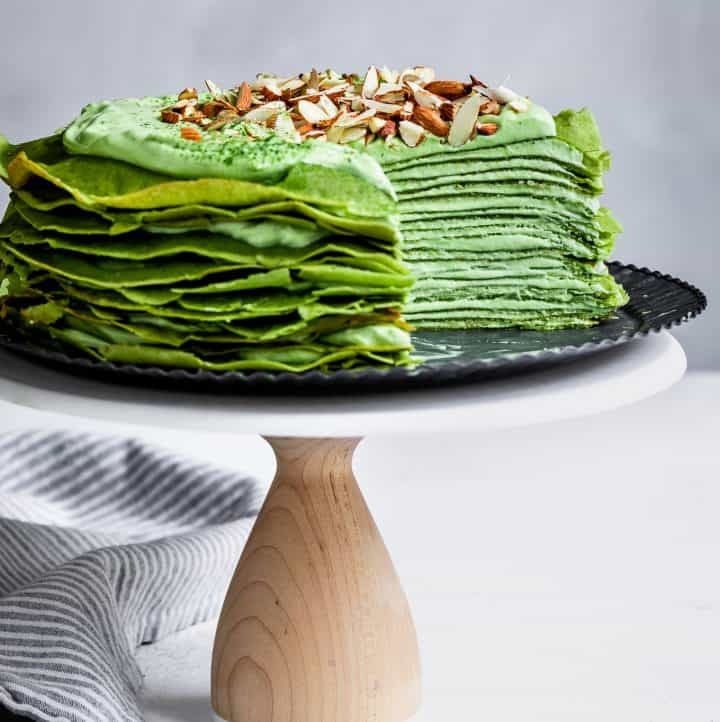 If you want a light chewy texture where the cake springs back when you glide your fork through it, that’s the role the xanthan gum plays in this cake recipe. 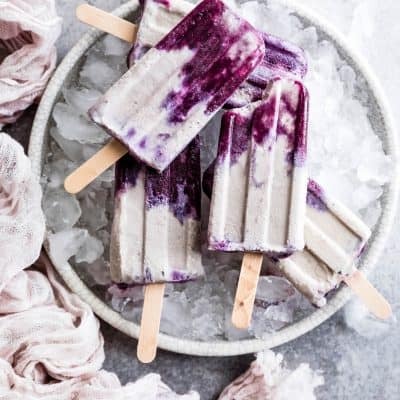 Tip: I store my xanthan gum in the fridge to extend the shelf-life up to 2 years and since I use so little in each recipe, one package goes a long way. Yes, actually! 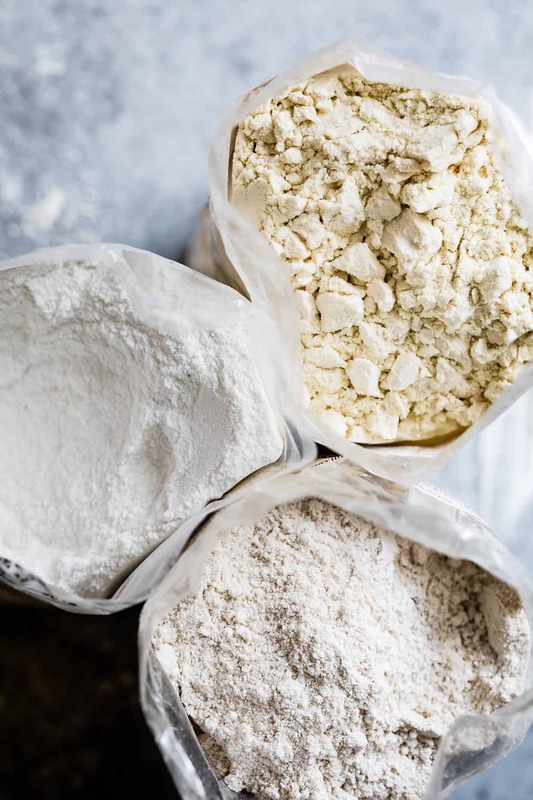 Each flour manufacturer mills their flours differently. 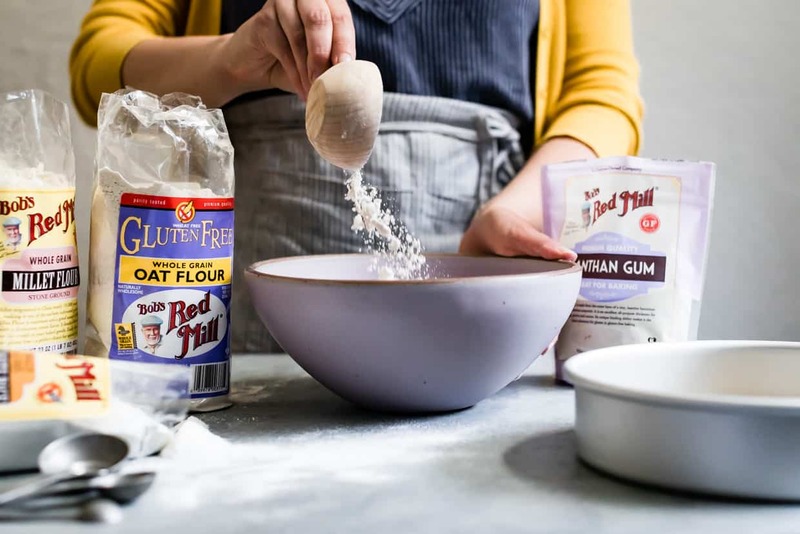 A whole grain gluten-free flour in one brand may be much more finely ground in another and this will impact how your finished baked good turns out. This means that 1 cup of one brand may way significantly different than 1 cup of another. For that reason, I recommend getting a kitchen scale and baking by weight to avoid any issues you may have in flour brand differences (also it’s so much quicker than measuring by cups!). I’ve tested this pumpkin cake with all Bob’s Red Mill flours, of which I have an entire shelf in my cabinet lined up alphabetically. 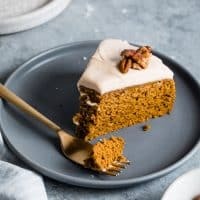 More pumpkin gluten-free Thanksgiving desserts to make this fall! I prepared my neighbors that they should expect nightly dessert from now the end of the year. 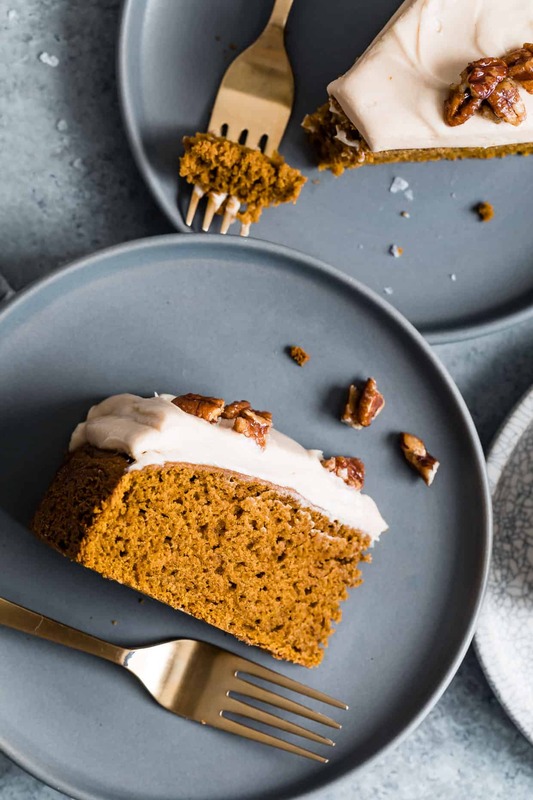 While you’re making your Thanksgiving plans, here are a few of my favorite pumpkin gluten-free Thanksgiving desserts for inspiration. Of course, be sure to check out the #VirtualPumpkinParty for more recipe ideas! 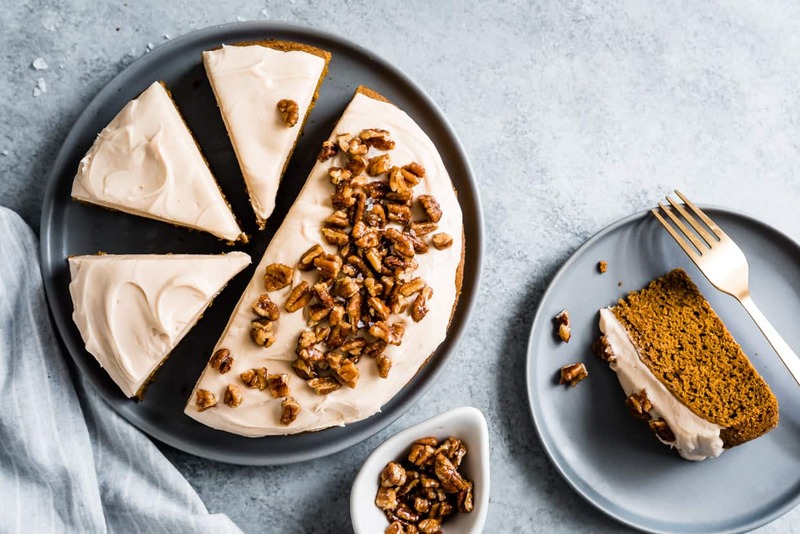 Soft and moist gluten-free pumpkin cake topped with salted caramel frosting. Filled with fall spices and a tender crumb, no one will believe it's a gluten-free cake! Preheat the oven to 350ºF. 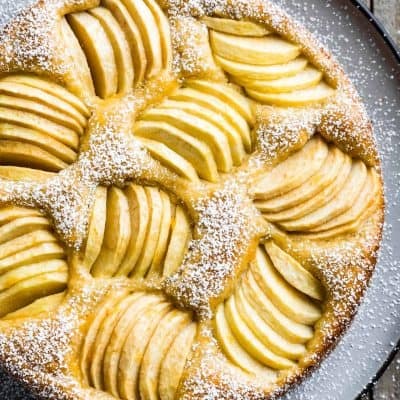 Lightly grease the bottom and sides of an 8-inch round baking pan with oil. Line the bottom with a round of parchment paper. 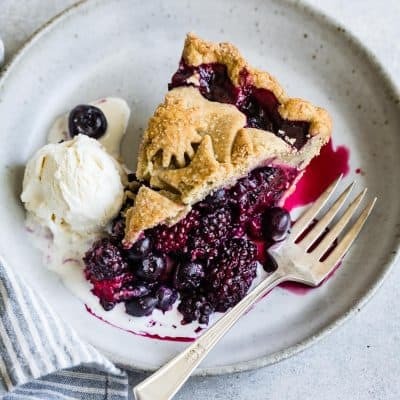 In a medium bowl, whisk together the millet flour, oat flour, sweet rice flour, xanthan gum (if using), baking powder, baking soda, cinnamon, ginger, nutmeg, cloves, and salt. Set aside. 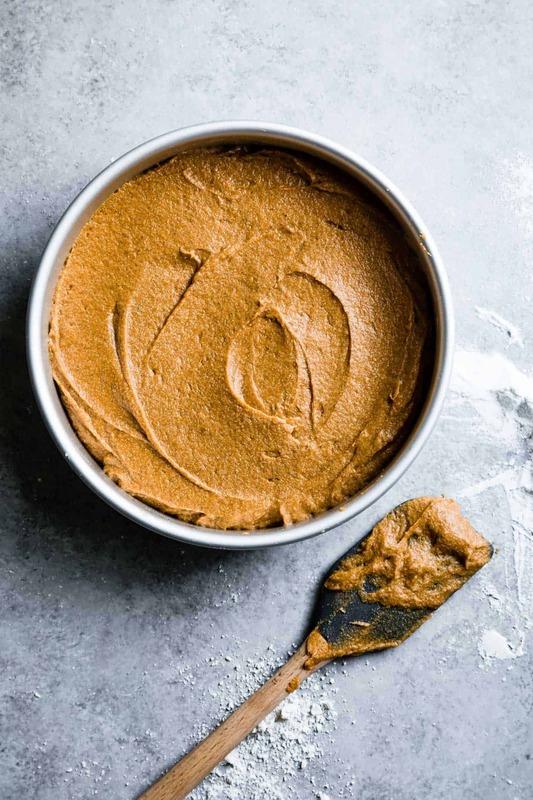 In the bowl of a stand mixer fitted with the paddle attachment or in a large bowl with a hand mixer or hand whisk, combine the pumpkin puree, sugars, vegetable oil until smooth. Add the eggs and vanilla extract and mix just until combined. With the mixer on low, gradually add dry ingredients to the liquid ingredients in two batches alternatively with the milk. Mix until just thoroughly combined. Pour the batter into the prepared pan and smooth out the top. Firmly tap the cake pan on the counter a few times to release any air bubbles. Bake for 35-38 minutes, or until the center bounces back when pressed and a toothpick comes out clean or with just a few crumbs.. Transfer to a wire rack to cool for 5 minutes before removing the cake from the pan, using a plate or two wire racks, and continue cooling on the wire rack until completely cool. While the cake bakes, prepare the caramel sauce for the frosting, if making homemade. Combine the sugar and water in a small saucepan over medium high heat, stirring occasionally just until the sugar melts. Let cook until the sugar begins to turn amber colored and smell nutty. Remove from heat and immediately pour in the cream, butter, and salt. Stir with a whisk until smooth. Transfer to a bowl and let cool completely to room temperature before adding to the frosting (I put mine in the fridge to speed this process up! Once the cake and the caramel sauce are cool, prepare the frosting. 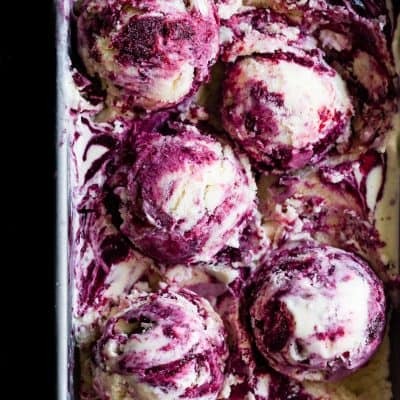 In the bowl of a stand mixer fitted with the paddle attachment or in a mixing bowl with a hand mixer, cream the butter and cream cheese over medium speed for 1-2 minutes, scraping down the sides as you go. Add 1/4 cup of caramel sauce and vanilla mix on medium speed until completely smooth. In two parts, add the powdered sugar and salt, mixing on slow speed until completely smooth, scraping down the bottom and sides as you go. Use an offset or rubber spatula to spread the frosting evenly over the top of the cake. 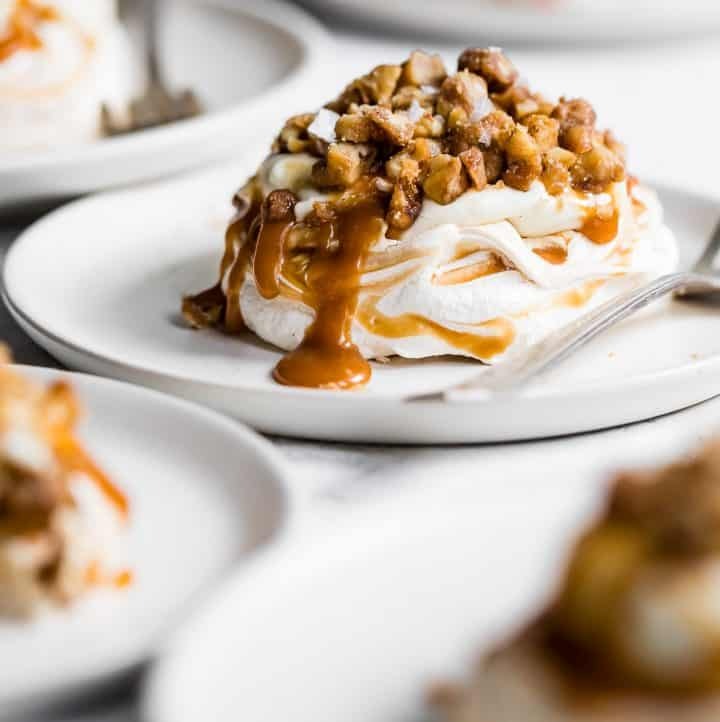 Top with candied pecans and serve. 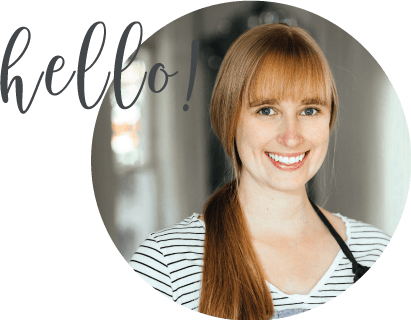 *If your store doesn't carry gluten-free oat flour, you can do what I normally do. I grind my own oat flour by blending Bob’s Red Mill’sgluten-free old-fashioned rolled oats a blender or food processor until smooth. 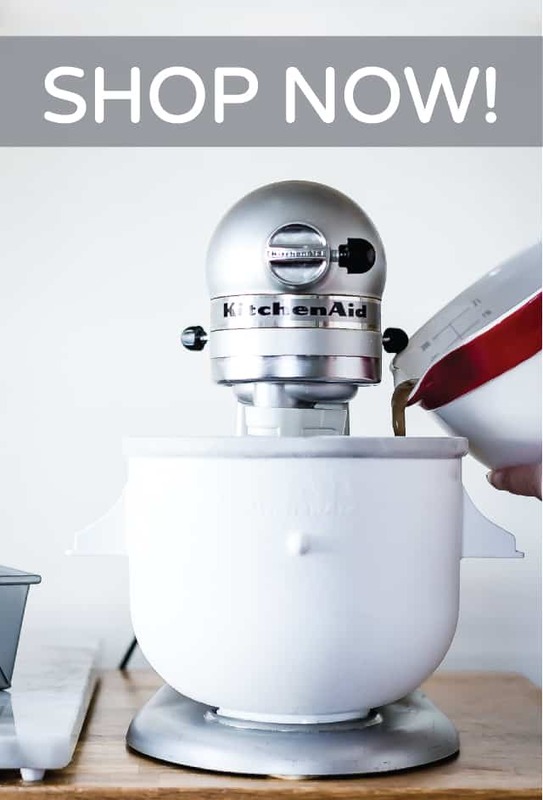 If you’ve got a high-powered blender, you shouldn’t need to sift, but if not, a quick sift will give you a more finely ground oat flour. **See above. You can leave out the xanthan gum if needed, but the result is a slightly gummier more dense cupcake. Oh my goodness! Found your post through the #virtualpumpkinparty and my goodness, these photos are stunning. The cake looks SO tasty too. The only gluten free baking I’ve done, I’ve used just a 1-1 gluten free flour, so I’m so curious now about the combination of all of these flours. Your post is so informative! Your photos are gorgeous and that cake is to die for! I love all things pumpkin! This cake is absolute perfection! The crumb looks amazing! This cake looks absolutely perfect! Love how easy it is to make! This cake is such a beauty! I’ve never tried the sweet rice, millet, oat combo but am seriously intrigued, especially since those are alternatives to a-p flour that I’m not allergic to. This is such a perfect holiday cake – gorgeous work, as always, Sarah. Can I make a bundt cake with this recipe?